Why you’ll pay for Apple’s $1,000 iPhone. Because Apple knows some consumers will pay anything—and others just need a little nudge. To ring in the 10th anniversary of the iPhone, Apple on Tuesday is delivering a handful of new smartphones that won’t just challenge your daily tech habits—no more home button!—but lighten your bank account, too. The new iPhone is expected to come with a $1,000 price tag, making it the most expensive Apple phone to date. That’s a decent leap from the iPhone 7 Plus, currently Apple’s most expensive phone ever at $769 (and with added storage that price goes up). The new device, in contrast, will approach the cost of a computer. But Apple has good reason to believe this jump won’t hurt it. Now that wireless carriers have moved away from subsidizing phones in exchange for contracts, we know the devices we rely on are actually quite expensive—and Apple has learned that millions of us are willing to pay a premium for them anyway. Though $1,000 represents the crossing of a serious psychological barrier, the company also knows it can make that price sting a little less by selling its phones to customers for a monthly fee, just like when they buy a car. While wireless carriers have offered payment plans for years, since 2015 Apple has had its own financing product, the iPhone Upgrade Program, through which users sign up to get a new iPhone every year after making 12 payments. The more expensive iPhones get, the more attractive some kind of financing becomes. And unlike some deals with carriers, Apple’s financing doesn’t lock users into a service contract, though some people may prefer to lump the bill for their device in with their monthly service fee. In terms of what they can actually do, the new phones are probably worth it. According to Neil Cybart, an Apple analyst who runs the website Above Avalon, Apple probably isn’t simply jacking up its price because it can get away with it. Rather, the $1,000 smartphone is more likely a fair reflection of the expensive new tech inside the phone, as well as the fact that consumers now depend on smartphones in more ways—and in many cases expect them to only get better. “I’m not necessarily expecting them to have higher margins on this particular iPhone. They’re pretty much trying to get the same margin that they already do, but that just means with a higher price,” says Cybart. Rumored features for the new phone include infrared facial recognition technology, a fancy curved screen, and wireless charging—tech that isn’t cheap and probably isn’t necessary for most of us, but which many consumers will decide are must-haves. 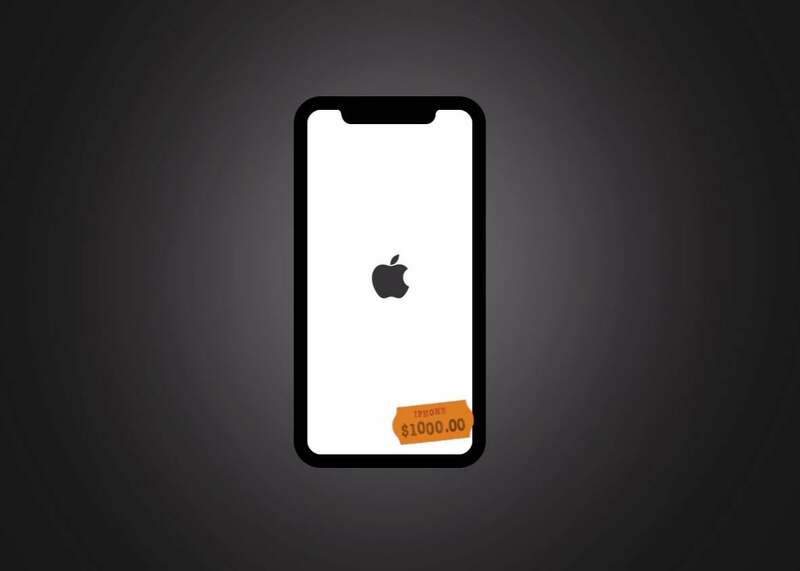 The sticker price likely has as much to do with Apple punting that additional cost back to the consumer as it is reflective of smartphones’ ever-increasing value in our lives. Americans now spend about five hours a day with their eyes on their smartphones, according to the analytics firm Flurry. People get email like water, and more and more businesses in the U.S. are moving their communications to chat-based apps like Slack, where co-workers message all day, even on their own personal mobile devices, as opposed to communicating through emails that can wait until they return to their keyboard. Smartphones have replaced the need to carry around newspapers, magazines, books, maps, and mp3 players. They mediate almost every aspect of communication in modern life. Still, whether it’s Apple or Citizens or Verizon doing the lending, getting your hands on a $1,000 iPhone with the help of a loan means your credit score could become a factor. And that means that iPhones might be transitioning into a different category of tech, a notch higher than an expensive accessory, perhaps the kind of product people think about as a long-term expenditure that could affect their ability to finance other large purchases down the line. The higher price, combined with the fact that the old-school contracts that locked customers into two-year phone plans are basically extinct, means more people may keep their phones for longer. Apple isn’t the only tech company with an expensive phone for sale, of course. Samsung launched its new (noncombustible) high-end phone, the Galaxy Note 8, with a price tag of $950 last month. And Apple still does have less expensive options, like its iPhone SE, which costs around $400. And it’s worth noting that even phones with a high price tag tend to perform well. The iPhone 7 was the company’s most expensive model, yet in the first quarter of this year it was the bestselling smartphone in the world, according to research from Strategy Analytics. It’s not that Apple is only appealing to high-end buyers as much as it is that, as a company, it doesn’t tend to make commodity products, says Brian Blau, an analyst at Gartner. But as Apple is trying to expand into markets outside of the U.S. and Europe, its high prices can make it tough to scoop up new customers. This summer, Apple reportedly lost its spot as the fourth most popular phone in China, and in India—one of the fastest-growing smartphone markets in the world—devices with similar capabilities of an iPhone sell at a fraction of the cost. The $1,000 new iPhone may not fly off the shelves there—except perhaps with wealthy consumers. And that probably suits Apple just fine. Unlike other electronics like mp3 players or tablets, which tend to decrease in price the longer they’re on the market, smartphones seem to be able to absorb higher price tags. And Apple’s hike could just make room for more success among Apple’s more affordable competitors. But it may also cement Apple as a truly luxury brand, and using an Android phone might start to look less like a matter of preference and more a reflection on what you can afford. That’s fine, unless essential, everyday services—the kind we need to apply for and keep our jobs and live our lives—are only available to those who have the cash to stay on trend. And even if consumers do experience some sticker shock, the most valuable company in the world can afford this experiment—or keep raising prices, even if its customers have to take out loans to remain members of Apple’s elite club.